Muscles and Mayhem? Yes, it’s going to be an evening of wine, great food, circus entertainment and general merriment. Special performance by Deflying Fitness! This is a night you won’t want to miss. So be sure to set a reminder for Friday, December 2nd and we’ll kick off the season right! Relax, unwind and get to know the StrengthBox community better. Current members, past members, prospective clients, family, friends and associates — ALL are welcome! 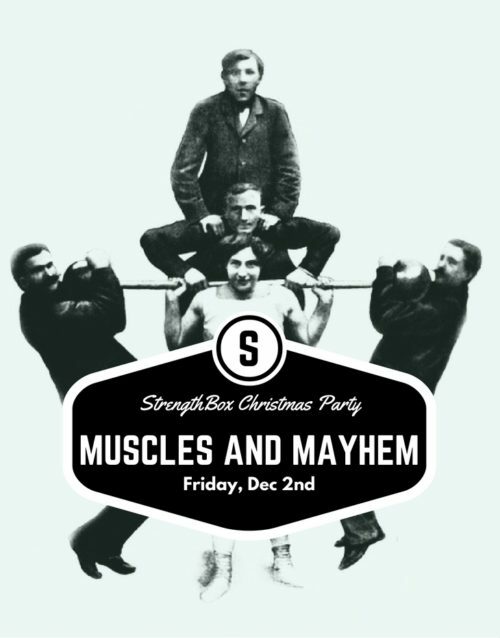 If you’ve got any connection at all with the StrengthBox community (or would like to come out and meet us), we’d love to see you there. Last training session of the day will be at 4:30pm.